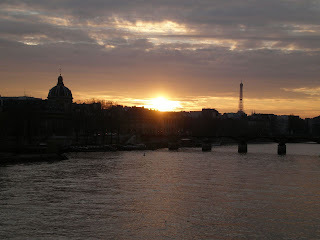 Today I saw my first sunrise here in Paris. Or I was able to catch a small glimpse of it while all the beautiful colours were reflected on the houses that surround me. Because the sun actually rises on the other side of the buildning I live in. I usually get to see the sunsets in stead. The reason I saw the sunrise? Well, apparently, all the sleeping during the weekend got back at me now. First, even though I went to bed pretty early yesterday, I didn't manage to fall asleep before something like 2 am. And at 5.45 in the morning I woke up again when my neighbour started to have some noice while she was (I guess) preparing breakfast. Then, after an unsuccessful hour of trying to fall back to sleep again, I decided I might as well just get up. So there I sat by my table, drinking tea while looking out of my window and listening to the amazingly quiet sounds of when the city slowly woke up to a new morning and a new week.